Become a hero with K.O. and use super radical moves to battle the evil Lord Boxman in OK, K.O.! Lakewood Plaza Turbo! Cartoon Network's brand new flagship series launches as an original game first, in a unique turn for the world famous company. Double Stallion Games creates unique player experiences in familiar genres using gorgeous 2D hand-animated aesthetics that feel fresh and dramatic to modern consumers. In 2013, we redefined what a beat-em-up could be on mobile with Big Action Mega Fight! and created an endearing off-the-wall game that lived up to the memories of our most cherished classics. The game launched for iOS and Android, and was ported to PC in early 2016. 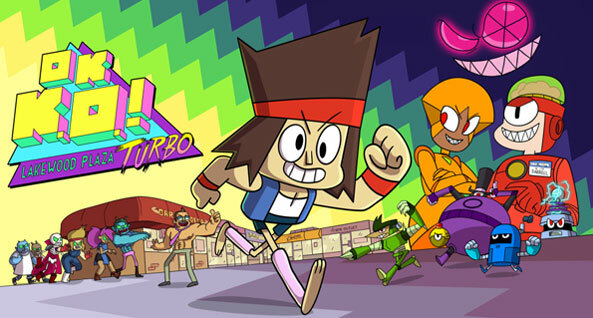 In 2014, we began a collaboration with Cartoon Network to launch their latest cartoon property: OK K.O.! Lakewood Plaza Turbo. In collaboration with the talent from the CN show Steven Universe, we created an explosive open-world action-adventure that is the largest title Cartoon Network has funded to date. It continues to rank among the most downloaded titles on iOS and Android. We are doubling down on action and spectacle for our next original title, Speed Brawl. Building ambitiously on our foundations, we plan to release the game on PC & consoles in Q1 2018.